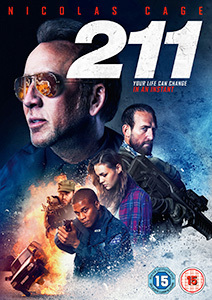 Police officer Mike Chandler (Nicolas Cage) and his partner Steve MacAvoy (Dwayne Cameron), who is also married to Chandler’s estranged pregnant daughter Lisa (Sophie Skelton), are given troubled black teenager Kenny (Michael Rainey Jr.) to take on a ride along for a day after he’s caught fighting at school. What starts off as a routine day, where Kenny is supposed to learn a lesson about making better life choices, soon takes a turn for the worst when Chandler is called to help out at a stand-off taking place during a bank heist. With Chandler leading his team, he attempts to protect Kenny and take down the bad guys. 211 starts off with far more ambition than it’s able to pull off. Opening in Afghanistan, a team of mercenaries kill an American businessman and his entire security team who had planned to cut them out of their share of his latest criminal dealings. Before they kill the man, they are told about a part of his latest fortune that’s being held in an American bank. In the first 10 minutes I think I witnessed more bad acting than I’ve seen in my life so far, and that is pretty impressive. It’s immediately clear why 211 skipped a theatrical release and headed straight to DVD. While there may be a sound premise, allegedly inspired by true events, it’s executed very poorly and you see that Cage is phoning in his performance. Aside from the atrocious script and poor all-round performances, with the exception of Power’s Michael Rainey Jr. who manages to outshine everyone, 211 suffers from not having a clue what story it’s telling. Is this a story of bad guys being taken down? Is it a redemptive story reconciling a father with his family? Or is it a heart-warming coming-of-age tale for young, troubled and bullied Kenny? By the time the credits roll, you’re none the wiser. The tone is so uneven it’s unintentionally hilarious at times. Too much time is taken up with action sequences, which to be fair are pretty well done, and the story gets lost along the way. The plot ‘twists’ are sign-posted so clearly, you’d be an idiot not to see what’s coming next. A good example is Kenny’s mother being assured that ride alongs are always very safe and you know instantly Kenny will be in peril shortly after. Perhaps one of the most disappointing things about 211 is Cage. When he’s good, he’s a very good actor but when he chooses the wrong material, you can understand why he comes in for the barrage of criticism he gets. He’s proven over his career that he can pull off a silly film and make it a must-see (e.g. Con Air) and he’s shown he can truly turn in fantastic performances (e.g. Lord of War). Unfortunately he has a habit of making some truly baffling decisions and the result ends up being something like 211. 211 doesn’t insult you further by including any extras. Once the film finishes and you scroll through the menu, you feel like the DVD is almost relieved you’re done. There is a good film in here somewhere but it gets completely and utterly lost. With poor direction and a script that should never have moved past first draft, 211 is a huge disappointment. Films can be trashy and stupid but they need to be entertaining too. 211 just made me cringe for 86 minutes, laugh-out-loud in all the wrong places and sigh as the next ridiculous scene unfolded.